Hi Everyone! 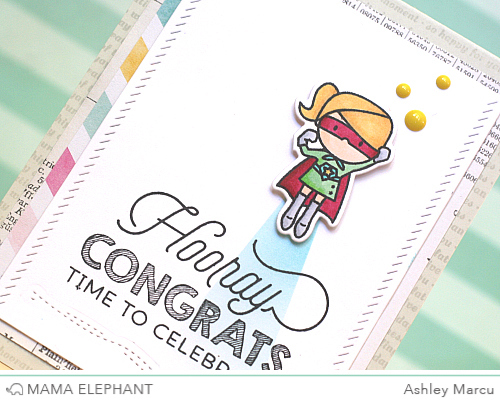 Ashley here sharing a card featuring the newly released Surprise Sentiments. I love this entire release and have used a few other great new products to compliment the trendy sentiment. This card started with the sentiment. I love the mix of fonts in this set! The curly Y in Hooray inspired me to create a super hero (found in the new Tiny Heroes set) flying up through the sentiment. I love how the super girl fits right above the curve. To create the scene I first die cut a piece of white card stock using the Sew Fancy dies. Then I stamped the sentiment and the super girl. The super girl will eventually be covered up but I needed her there to get my placement right. Next, I masked off an area below her and inked it up, gradually going from dark to light. Once I was done with the ink I used the Sew Fancy dies again to add the stitched lines below the sentiment. 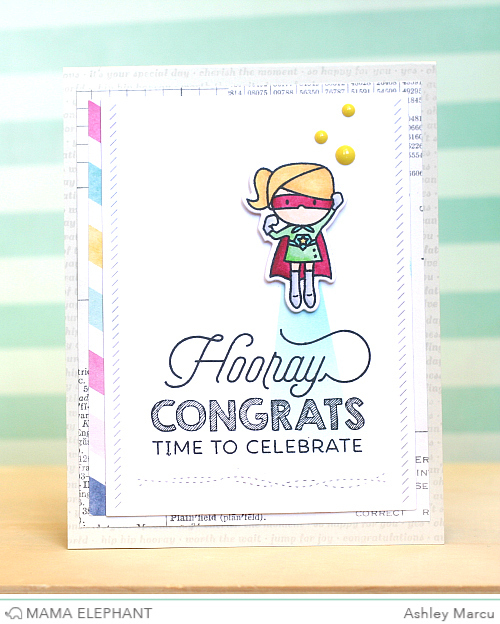 Next I stamped the super girl image again on a separate piece of card stock and die cut it with the coordinating dies. I colored her with Copics and adhered her to the panel using dimensional adhesive. I finished the card with a few different patterned papers and stamped the card base with Sentimental Borders. Thanks for joining me today! I can't wait to see how you use Surprise Sentiments! Love the little touch of the super hero taking off! Great idea! The glow was a genius idea! This is such a cute card! I love the stitching die detail at the bottom of the card! What a great card. Love how you made the background and all the papers make it special. Love the few dots of yellow. Thanks for sharing. Super cute card - beautiful design, great coloring. I love the news print in the back. 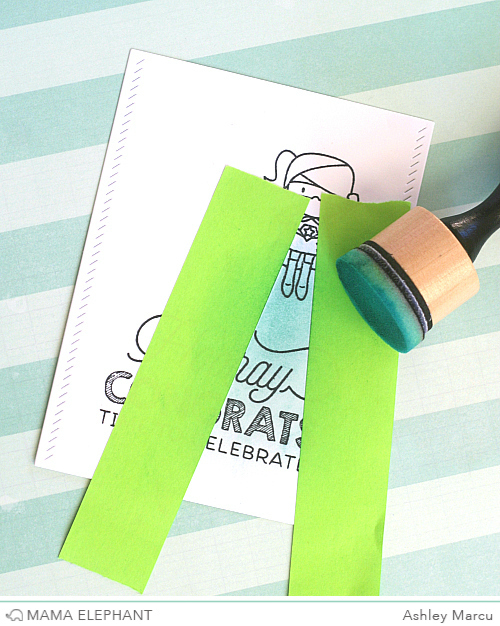 love this card~ the fonts in this sentiment stamp set are so cute!